The Z445 EZtrak mower delivers more speed and better handling than ever before. Our engineers were not content to let these fine mowers rest on their laurels, so added thicker grips on the motion-control levers and installed wash ports on the mower decks to reduce grass-clipping build-up. 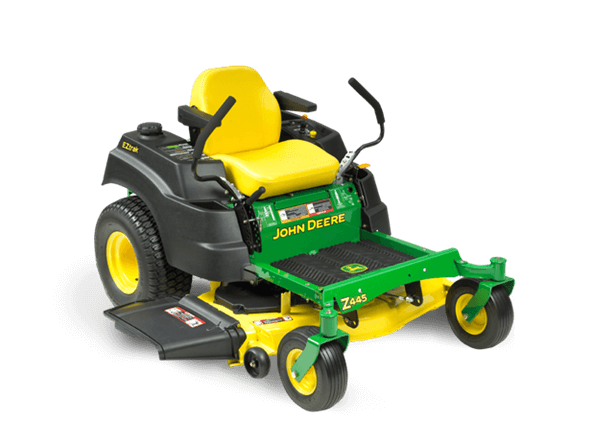 The Z445's heavy-duty frame and its engine design ensure durability and unmatched performance. No matter what John Deere zero-turn mower you choose, you can rest assured you are getting a machine designed to meet your needs.